Global warming could be addressed by a carbon tax if the tax revenue was divided and each taxpayer given an equal share as a dividend. Dr. Theda Skocpol , a Harvard University scholar and a former president of the American Political Science Association, recently addressed an audience at Tulsa University about the futility of pursuing a cap and trade policy to reduce carbon emissions. Cap and trade was once considered to be the free market solution to pollution as it was used successfully by Presidents Reagan and George H. W. Bush to reduce the sulfur emissions causing acid rain. To address carbon emissions by cap and trade legislation seemed to have the support of both businesses and politicians when it came up in Congress in 2008. However, it failed by a wide margin, even though Democrats controlled both houses of Congress. Dr. Skocpol was commissioned to study why. She quickly decided the question was not why the legislation failed, but why anyone thought it could pass. “Anybody who thought any issue having to do with environmental regulation or global warming was not a partisan issue … wasn’t looking at the data,” she said. Research: Dr. Skocpol’s research was aimed at understanding why the legislation failed. The League of Conservation Voter’s scores on environmental issues showed that about 55 % of the Congressional Democrats and 30% of the Republicans had pro-environmental scores in 1970. However, those began diverging in the middle 1990’s and by 2008 the scores averaged about 85 % for the Democrats and about 20% the Republicans. Clearly Congress had become more polarized on the issue, with many Republicans changing their position and Democrats, particularly those from fossil fuel producing states, having little incentive to support regulating carbon emissions. The reasons had to do with popular attitudes about the cost and the actual threat posed by climate change. Addressing climate change would raise energy prices in the near future, while the benefits would mostly be to future generations. A survey examining tolerance for costs found those in the lower income brackets would be willing to pay up to 20% more for electricity while those in the top brackets would be willing to pay 10% more. Beginning about 2005, there was a stepped up media campaign to spread misinformation about the cost to taxpayers and doubt about the scientific evidence for climate change. One false claim was that cap and trade would cost each U.S. household $3,100 a year. However, John Reilly, the MIT economist who authored the study, said that talking point was a serious distortion of his work. The EPA estimated more realistically that it would cost on average about $140 per household annually. The opponents of regulating carbon emissions followed the successful path used by the tobacco industry. Rather than trying to address the evidence compiled in thousands of scientific research papers, the fossil fuel companies use their vast resources to spread doubt about the conclusions of the research and the effect it would have on the Earth’s ecosystems, climate, and weather. They used the same network of foundations, Libertarian think tanks, front groups, and hired grassroot organizations used by the tobacco industry to spread doubt. And, it worked. Many people were unwilling to support environmental regulations that might raise energy prices, particularly if there might be doubt about the scientific evidence. When it came right down to it, the public did not understand cap and trade well, and distrusted a system created by big business and politicians. 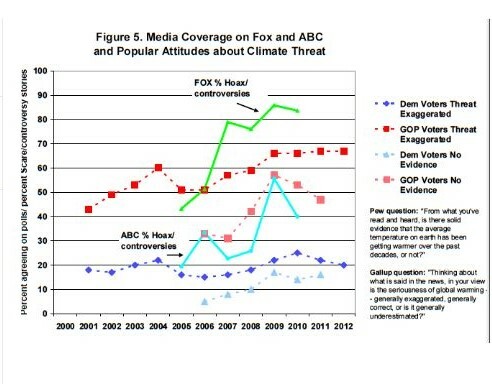 Dr. Skocpol’s graph below shows how the change in voter attitudes correlated with the propaganda campaign to spread doubt. Clearly, the opinion of voters , particularly Republican voters , had changed. Dr. Skocpol commented that data shows the question really was “not why cap and trade didn’t pass, but why anyone thought it would”, given the polarization that existed in Congress and in the population. It was her opinion that any attempts to revive a cap and trade agreement would be futile. Dr. Skocpol pointed out that her assessment comes not from a climate-change denier, but from someone who believes irreparable damage might already have been done to the atmosphere. But as a political scientist, she said the data is quite clear: “Congress has no interest in or incentive to act. ” What then can be done? The Energy Dividend: Certainly the problem needs to be addressed, and it was her opinion that progress could only be made if everyone was given a stake in the solution. Her proposal was that it could be addressed by a carbon tax if the tax revenue was divided and each taxpayer given an equal share as a dividend. The dividend would be $800 per year if the carbon tax was the same as Australia’s, $23 per ton of CO2 emitted. Alaska has used a similar system successfully by taxing oil produced on public land and dividing some of the revenue equally among all Alaskan citizens. Over the past 31 years, each man, woman, and child in Alaska has received on average $1100 per year from that tax revenue. The energy dividend produced by a tax on carbon should also help the economy. In 2008, George W. Bush gave each taxpayer a one-time $300 (or greater) tax rebate to stimulate the economy. A several hundred dollar energy dividend each year would give each citizen a stake in reducing carbon emissions and make up for any increase in energy prices. The tax on carbon would also level the playing field for other energy sources, making investments in renewable energy more desirable. Note added on 06/21/2014: Henry Jacoby, an economist at MIT’s business school, says there’s really just one thing you need to do to solve the climate change problem: Tax carbon emissions. “If you let the economists write the legislation,” Jacoby says, “it could be quite simple.” He says he could fit the whole bill on one page. Click here for his article. This entry was posted on Thursday, August 15th, 2013 at 12:11 pm	and is filed under Energy and the Environment. You can follow any responses to this entry through the RSS 2.0 feed. You can leave a response, or trackback from your own site. Another suggestion is that part of the tax collected be used as an energy dividend and that part be used to pay down the national debt. A $23 a ton tax on carbon emissions would generate about $115 billion each year, and 25% of that would make a small dent in the national debt.